It's Leap Day! An extra day on the calendar. It's like having a snow day, and thankfully there are no flakes forecasted. I'm in the studio today working on a new-to-me format with supplies from my studio stash. My fingers are sore but I'm enjoying a new process. I'm completely making this up as I go. Don't you love stretching yourself with something different? You always bring fresh perspective to your default way of working. I'll show you soon. Take the opportunity today to leap! Leap quotes from 2008 HERE. I'm so excited to finally be able to share this news - the first four in a series of New York stencils, exclusively for The Ink Pad. Shop online at their newly launched site....it's only a few minutes old. Congrats Anna and Barbara!! 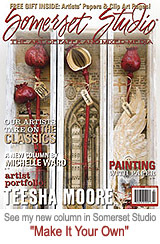 The March/April issue of Somerset Studio just arrived. I am thrilled for my friend Anna who is on the cover and inside with the Artist Profile - her signature work is lovely and unique. Since the theme is Mail Art my column features art made with security envelopes, and then I segued into using postage stamps. If you've been following my blog you know I love these security paper patterns, found on the inside of the dreaded bills. I've been collecting and cataloging for years - now I can't stop making stuff with them. See my other posts using security envelopes last year. There are patterns here I don't have!! Maybe it would be fun to show you my collection and if you have a pattern I don't have we could trade!! Brrrrrr. It's a cold one here today. Hope you are nice and toasty wherever you are, and wrapped in love. My grand plan for launching my new stencils in January got side-lined. Some fun assignments came my way so I shelved my own stuff until these new things are done. I'm not sure when I can tell you about all of it with the exception of a new venture that will begin in April. I will have some sneak peeks for you in the coming weeks. Thanks for your interest in the new stencils - I will squeeze in some production when I can and will post here when they are ready. Gotta say, it can be crazy to be so busy, but I'm not complaining! Yes, we are ready for the big game. Graham has the menu planned and good smells are coming from the kitchen. My neighbor Emma came over to make Valentines. This year I taught her about dry embossing. We did it the real way, with brass stencils, a lightbox, and a stylus tool. After one I knew she'd be antsy because it takes alot of handpower and patience to complete. So then I introduced her to embossing folders and the short-cut for embossing. We will ran our die-cut hearts through the hand-cranked pasta machine (typically used for polymer clay - I've never made pasta). She finished a dozen in no time and then we moved on to addressing and decorating envelopes. Assignments are finished so we will open some of the Girl Scout cookies she delivered. A reminder of using embossing folders with a pasta machine from 2011. Such a fun and fast way to get texture! I can't recall where I picked up my first fragrance from Ineke. It may have been from Anthropologie. I was first drawn to the package, then was sold on the scent. When I was down to the very last drop I went searching for a replacement, and landed at Ineke.com Suddenly everything looked tempting so I was thrilled by the opportunity to order the sampler sets. What a treat it was when they arrived! The two sets are packaged so handsomely, with glorious graphics and details. I ended up with another bottle of my favorite: Scarlet Larkspur. Curious? Visit the website. 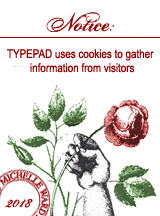 Be sure to stay long enough for each graphic to scroll - there are about 6 images per scent. The descriptions of the 'notes' are delicious, and as an experienced sample sniffer I can tell you that each one is a champ. I purposely pair new fragrances with new projects. It's a little trick that assists the subliminal to retrieve the verve and enthusiasm first felt upon initiation of the process. When I'm ready to revisit or continue I take a little whiff and I'm transported. You know it works. You have memories that are associated with smells. Why not use that knowledge to help you in the studio?